A bowl of La Paz batchoy. Iloilo is home to a lot of historical structures and landmarks. It is also home to a lot of cuisine that makes it synonymous to a particular place in Iloilo. To start off, there's La Paz batchoy. As the name suggests, La Paz batchoy originated in the district of La Paz in Iloilo City. It was served as far back as the late 1930s and seems to be a marriage of Spanish and Chinese influence which resulted to a Filipino dish. Chicharon is responsible for the Spanish influence while noodles came from the Chinese. Both influences are the major ingredients in the making of batchoy. Aside from the two, the dish has meat from chicken, pork and shrimps simmered in a hot broth. To harmonize all the ingredients, garlic, onion and soy sauce are added with a dash of salt and pepper. As with most soups, it should be served hot. Perfect for a rainy day! Pancit Molo waiting to be devoured. Another gastronomic treat that speaks of Iloilo City is pancit Molo. Pancit is a kind of noodle that may be part of a soup or served dry but oftentimes oily. However, in the case of pancit Molo, you can't see any noodle. That is because what is referred to as pancit in this dish is the wrapper that is used to enclose ground pork. Imagine siomai or pork dumplings drowned in broth. Sometimes pork is coupled with shrimps. Others may substitute pork entirely with shrimps for whatever reason. Perhaps, they have a preference for the taste of shrimp or due to health reasons. The dumpling itself is not just pork but includes spices like garlic, onions and ground pepper as well as ginger and maybe some carrots. The broth is also seasoned with spices and maybe garnished with scallions. It's up to you if you would like to use chopsticks. Mmm... tasty! 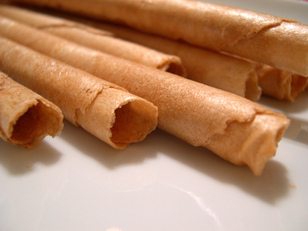 Barquillos - wafers rolled like pipes. Iloilo is not all viand or soups. They also have numerous kinds of pastries, a lot of which have Spanish-sounding names. There's biscocho which is actually toasted bread, but very crispy. Sometimes, if the biscocho seems sticky and creamy, it's probably drenched in milk. There's bañadas, which is a cookie that is about 2 inches in diameter and there's barquillos which is like a wafer stick. Another treat is galletas -- a round, flat biscuit about the size of a person's palm. People with sweet tooth might go for bandi -- still a somewhat round delicacy made of peanuts, bound together by caramelized sugar. If peanuts aren't your thing, you can choose bucayo which is made of strips of young coconut. It is still sweetened by melted sugar but oftentimes are not stuck to each other. Another sweet concoction is the meringue. Often, meringue is used as a topping for cakes. But in Iloilo City, the topping is a bit hardened like a puff candy. Aside from these, merienda or snack time or tea can also be served with banana cake or carrot cake. Donuts also accompany a cup of coffee. Yum! Yum!